Silver-tone stainless steel case with a dark blue leather strap. Fixed bezel. Mother of pearl dial with blue hands and Arabic numeral hour markers. Dial Type: Analog. Jaeger Lecoultre Calibre 967A automatic movement. Scratch resistant sapphire crystal. Transparent case back. Round case shape, case size: 29 mm, case thickness: 8.73 mm. Water resistant at 30 meters / 100 feet. Functions: hour, minute, second, day/night indicator. Luxury watch style. Watch label: Swiss Made. 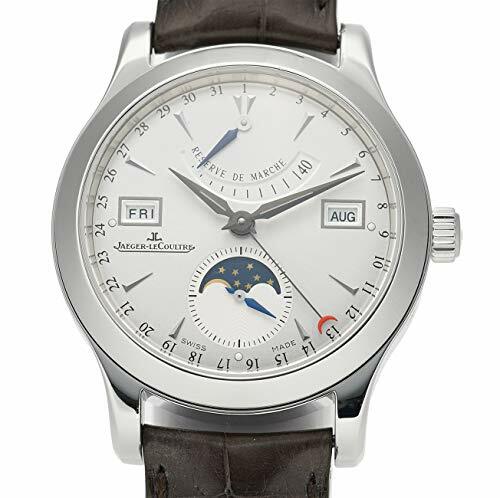 Jaeger Lecoultre Rendez-Vous Night Day Small Mother of Pearl Dial Automatic Ladies Watch 3468410. Silver-tone stainless steel case with a blue alligator leather strap. Fixed bezel. Silver dial with blue hands and Arabic numeral hour markers. Dial Type: Analog. Jaeger LeCoultre Calibre 898A/1 automatic movement. Transparent case back. Round case shape, case size: 34 mm, case thickness: 8.52 mm. Water resistant at 30 meters / 100 feet. Functions: hour, minute, second, day/night indicator. Additional Info: diamond:~60 ~0.63 carats. Luxury watch style. Watch label: Swiss Made. 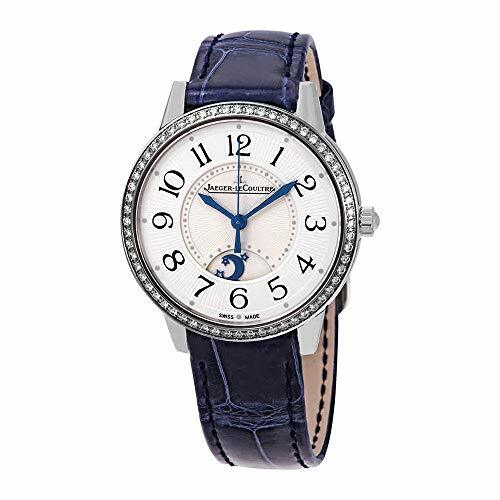 Jaeger LeCoultre Rendez-Vous Night and Day Automatic Ladies Diamond Watch Q3448430. Silver-tone stainless steel case with a leather strap. Fixed bezel. Silver/black dial with blue hands and Arabic numeral hour markers. Dial Type: Analog. Jaeger LeCoultre Calibre 844 hand wind movement. Scratch resistant sapphire crystal. Rectangle case shape, case size: 34.2 x 21mm, case thickness: 8.7 mm. Water resistant at 30 meters / 100 feet. Functions: hour, minute. Additional Info: gems:diamond:~30 ~0.28 carats. Luxury watch style. Watch label: Swiss Made. 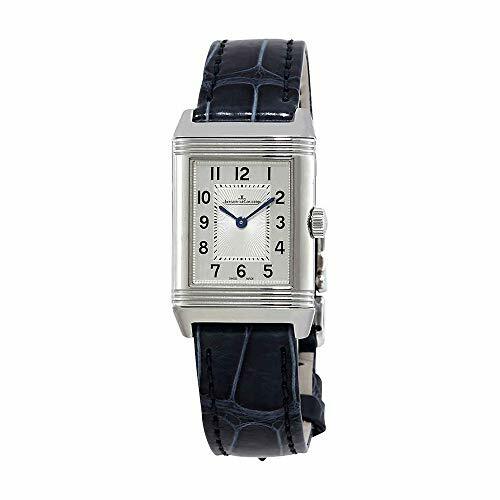 Jaeger LeCoultre Reverso Classic Ladies Hand Wound Watch Q2668432. Stainless steel case with a black leather strap. Fixed stainless steel bezel. Silver dial with blue hands and Arabic numeral hour markers. Minute markers around an inner ring. Dial Type: Analog. Day / night display at the 6 o'clock position. Automatic movement with a 42 hour power reserve. Scratch resistant sapphire crystal. Pull / push crown. Case diameter: 29 mm. Round case shape. Fold over clasp. Water resistant at 30 meters / 100 feet. Luxury watch style. 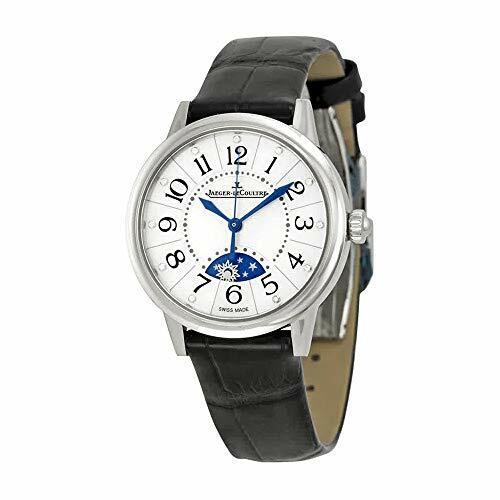 Jaeger LeCoultre Rendezvous Silver Dial Black Leather Ladies Watch Q3468490. 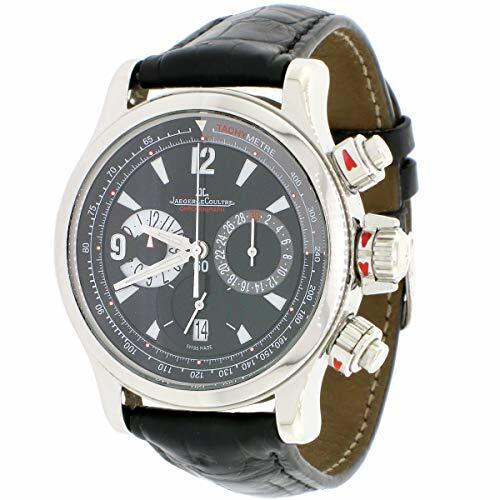 JAEGER-LE COULTRE MASTER COMPRESSOR STAINLESS STEEL CHRONOGRAPH AUTOMATIC MENS WATCH, REF 146.8.25. SELF-WINDING AUTOMATIC MOVEMENT. STAINLESS STEEL 42MM IN DIAMETER. SCREW-DOWN CROWN. THE WATCH IS EQUIPPED WITH A SCRATCH-RESISTANT SAPPHIRE CRYSTAL COVERING THE ORIGINAL JAEGER-LE COULTRE BLACK/CHARCOAL GREY DIAL. FUNCTIONS: HOURS, MINUTES, DATE, AND AND CHRONOGRAPH. AFTERMARKET BLACK CROCODILE LEATHER STRAP WITH ORIGINAL JAEGER LECOULTRE STAINLESS STEEL DEPLOYMENT BUCKLE. EXCELLENT, PRISTINE CONDITION, WORKS FLAWLESSLY, COMES WITH PRESENTATIONAL NON-JAEGER-LE COULTRE BOX AND ELEGANTSWISS ONE YEAR WARRANTY. THE WATCH IS RUNNING STRONG AND KEEPING ACCURATE TIME, HAVING BEEN TIMED TO PRECISION ON WITSCHI EXPERT TIMING MACHINE. SKU# ES25044048. BUY WITH CONFIDENCE KNOWING EACH TIMEPIECE GOES THROUGH THE SAME RIGOROUS 31-POINT INSPECTION. REST ASSURED ONLY AUTHENTIC PARTS STRAIGHT FROM THE MANUFACTURER ARE USED. THE CERTIFIED PRE-OWNED PROGRAM ON AMAZON ENSURES PEACE OF MIND AND TRANSPARENCY VIA STANDARDIZED REPORTS AND A 1 YEAR WARRANTY PROVIDED BY WATCHFACTS. 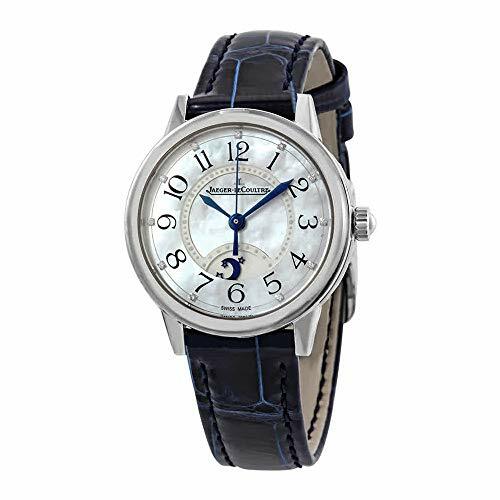 JAEGER LECOULTRE HERAION 116.1.33 MENS WATCH. 36MM 18K YELLOW GOLD CASE AND BEZEL. WHITE DIAL WITH LUMINOUS STEEL HANDS AND GOLD INDEXES. DATE DISPLAY. BLACK ALLIGATOR LEATHER STRAP WITH GOLD-TONE BUCKLE. WILL FIT UP TO A 7-INCH WRIST. QUARTZ BATTERY MOVEMENT. THIS WATCH IS BACKED BY OUR ONE YEAR WARRANTY. . BUY WITH CONFIDENCE KNOWING EACH TIMEPIECE GOES THROUGH THE SAME RIGOROUS 31-POINT INSPECTION. REST ASSURED ONLY AUTHENTIC PARTS STRAIGHT FROM THE MANUFACTURER ARE USED. THE CERTIFIED PRE-OWNED PROGRAM ON AMAZON ENSURES PEACE OF MIND AND TRANSPARENCY VIA STANDARDIZED REPORTS AND A 1 YEAR WARRANTY PROVIDED BY WATCHFACTS. 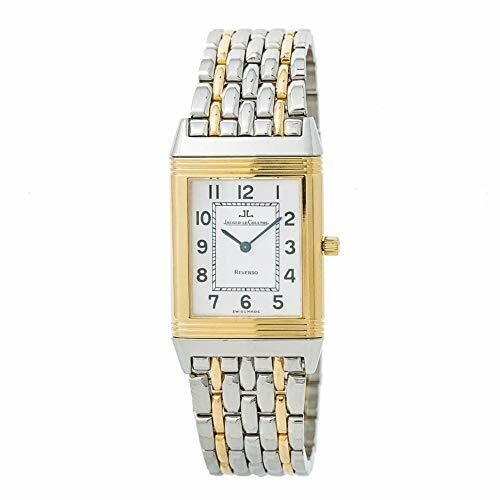 JAEGER LECOULTRE, REVERSO, 250.5.08, QUARTZ, NEW, PRODUCTION YEAR:1997, CASE MATERIAL: YELLOW-GOLD, CASE DIAMETER: 23.0 MILLIMETERS, BEZEL MATERIAL: YELLOW-GOLD, DIAL COLOR: SILVER, BAND MATERIAL: TWO-TONE-STAINLESS-STEEL, BAND COLOR: SILVER, NO BOX OR PAPERS, EXTERNAL CONDITION: EXCELLENT, BUY WITH CONFIDENCE KNOWING EACH TIMEPIECE GOES THROUGH THE SAME RIGOROUS 31-POINT INSPECTION. REST ASSURED ONLY AUTHENTIC PARTS STRAIGHT FROM THE MANUFACTURER ARE USED. THE CERTIFIED PRE-OWNED PROGRAM ON AMAZON ENSURES PEACE OF MIND AND TRANSPARENCY VIA STANDARDIZED REPORTS AND A 1 YEAR WARRANTY PROVIDED BY WATCHFACTS. 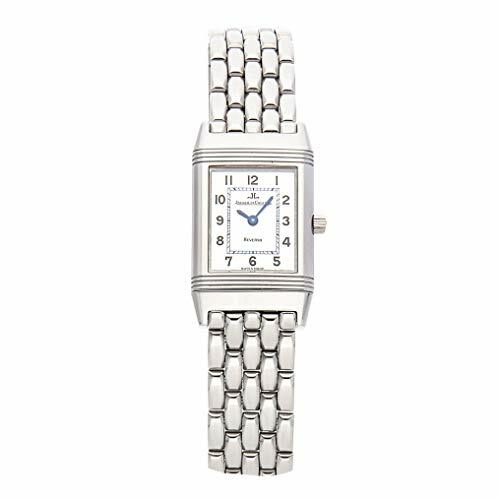 Jaeger-LeCoultre Reverso Lady (Q2608120) manual-wind watch features a 33mm x 20.5mm stainless steel case surrounding a silver dial on a stainless steel bracelet with folding buckle. Functions include hours and minutes. This watch comes complete with box and papers. We back this watch with a 15-month warranty! 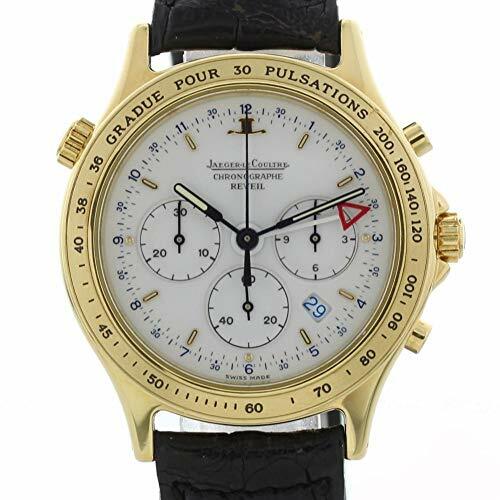 When a collector purchases a Jaeger-LeCoultre he joins the ranks of an elite clientele including Cartier IWC Patek Philippe Bulgari Vacheron Constantin and Audemars Piguet all of these august marques have patronized JLC's watchmaking expertise. 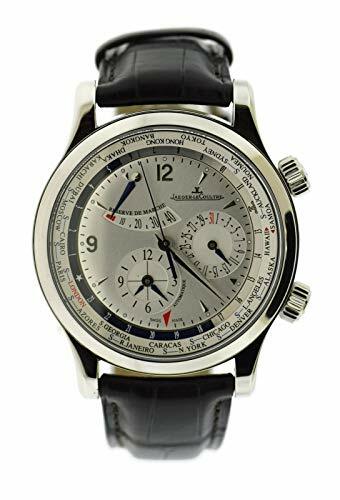 Besides universal competence as a true manufacture Jaeger-LeCoultre is famed for its Memovox wrist alarms grand complications and the Reverso family of reversible-case watches. Jaeger LeCoultre women's watch from 1962. Attractive white gold tear shape.